This database is updated on line, by the webmaster. As a result, as soon as an entry is edited or added it will appear to users. Please continue to report errors and supply further information by using the contact us button. More accurate dates of birth are now available, for some people, using information from the 1939 register. However, many people are still masked as "living" because we have no death dates for them or when their record was added they were not yet 100 years old. New: Jewish Tours of West Yorkshire: Contact Nigel to discuss a tour. The Leeds Database started as a project in 2000. Originally, the intention was to gather data on Leeds Jewish families from the available censuses and absent voter’s lists, plus various burial and marriage collections, not then on the internet. Gradually, it grew and mutated as more and more became available. It started to include Jewish Chronicle notices, items from the London Gazette, naturalisations and the later censuses (1901 and 1911) as they were released. As with any work of this nature it started to go beyond the confines of Leeds and records on families were subsequently added from other areas. There are undoubtedly errors. 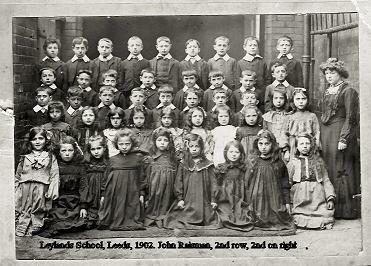 Some have come to light during the course of exchanges with list members and non list members about Leeds families. Despite checking of records it is VITAL that you check all records for errors before accepting any data given here. If you find an error please report it to us, make sure you cite your source, please. If you have something to share please let us know. Use the contact us button on the right. Please remember that the Leeds Database falls within our databases collection and is only to be used under the terms and conditions you agreed to when logging in. We hope you enjoy the Leeds Database. Background on how it all began and how it turned out. Theresa Stewart shares some of her research stories on this fascinating family. John Raisman writes about his family history, plus a book review by Naomi Barnett. Sherry Landa has written numerous pieces about her own family history research which was the precursor of the Leeds Database . IMMIGRATION To Leeds from Lithuania & Latvia. Angie Elfassi shares a momentous trip. MORE On Engagements, Betrothals & Forthcoming Marriage Announcements. How many announcements in the press, were actually followed up with a marriage? Not as many as you might think according to this article by Sherry Landa. JOSEPH Jewish Genealogy in Leeds-from Abroad. The story of Jonny Joseph's research journey.